This might be the scariest lawn ornament in Detroit. Its made of ancient rusted Detroit steel, spews fire in every direction, and was welded together by art students. Be afraid, be very afraid. Art Cars and beaters have a lot in common. They're both great reasons to scour junk yards and waste invest time in the garage. Although for all the projects I've envisioned over the years I never dreamed of anything like this. Some project cars make you feel like you're in purgatory, this one gets you that much closer by feeling the fire. 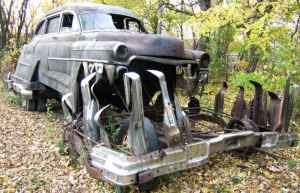 This progeny of a 1940's Dodge Flower car, a three-axle military vehicle and a group of art students spent fifteen years in storage and another ten in this guys back yard, so it needs a little love. Apparently, not every part of the car is flame proof. A front tire withered under the intense heat and so has one front window but that's to be expected. From the ad: "I've been told this was a regular occurrence, especially when hotter gases were used." The vehicle's running condition and powertrain aren't mentioned in the ad, which probably means it doesn't have any. Its a piece of Detroit art that needs a good home. Someone who's willing to display a tooth, flaming Dodge Flower car that may burn itself, and the surrounding neighborhood, to hell. I'm pretty certain from pictures it's a Cadillac and not a Dodge, haha.